Will the real emissions target please stand up? 4. Parties should collectively reduce global emissions by  per cent from 1990 levels by 2050 and should ensure that global emissions continue to decline thereafter. Developed country Parties as a group should reduce their greenhouse gas emissions by [[75-85][at least 80-95][more than 95] per cent from 1990 levels by 2050] [more than 100 per cent from 1990 levels by 2040]. 18. These commitments are made with a view to reducing the aggregate greenhouse gas emissions of developed country Parties by [at least] [25–40] [in the order of 30]    [X* per cent from  [or 2005] levels by  [and by [at least] [YY] per cent by 2050 from the  [ZZ] level]. 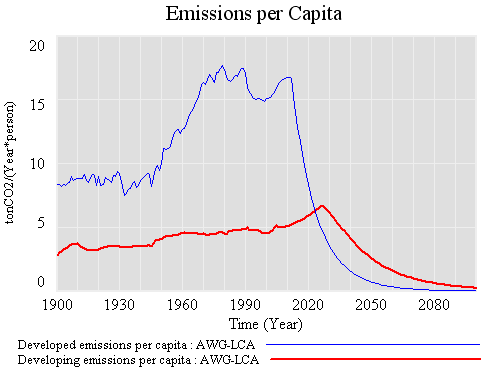 Author TomPosted on July 12, 2010 Categories Policy, Post-CopenhagenTags AWG-LCA, Bonn, emissions, target, UNFCC1 Comment on Will the real emissions target please stand up? The first shows the scale of carbon embodied in trade. 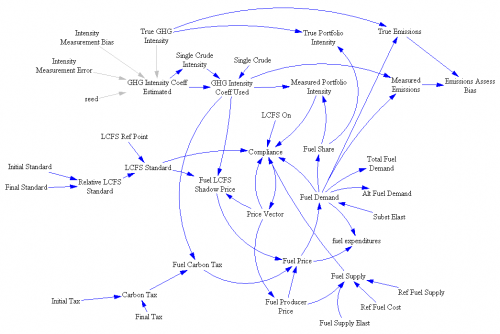 The second, even if it overstates true intentions, demonstrates the threat of carbon outsourcing. Both are compelling arguments for border adjustments (i.e. 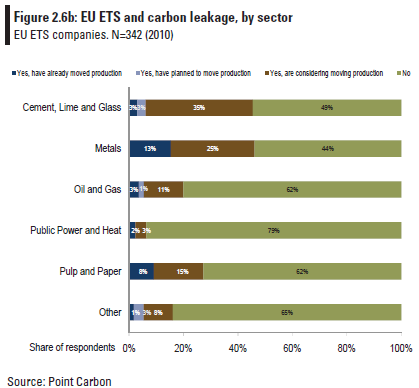 tariffs) on GHG emissions. 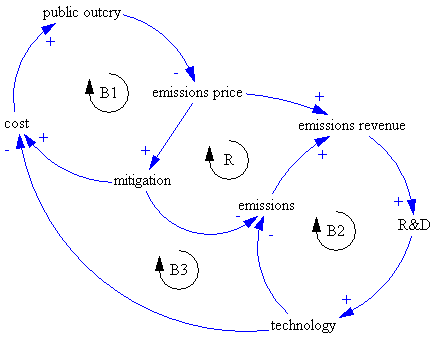 I think things could easily go this route: it’s essentially a noncooperative route to a harmonized global carbon price. Unlike global emissions trading, it’s not driven by any principle of fair allocation of property rights in the atmosphere; instead it serves the more vulgar notion that everyone (or at least every nation) keeps their own money. Advocates of BCAs claim that the measures are intended to address three factors. First, competitiveness concerns where some industries in developed countries consider that a BCA will protect their global competitiveness vis-a-vis industries in countries that do not apply the same requirements. The second argument for BCAs is ‘carbon leakage’ – the notion that emissions might move to countries where rules are less stringent. A third argument, of the highest political relevance, has to do with ‘leveraging’ the participation of developing countries in binding mitigation schemes or to adopt comparable measures to offset emissions by their own industries. 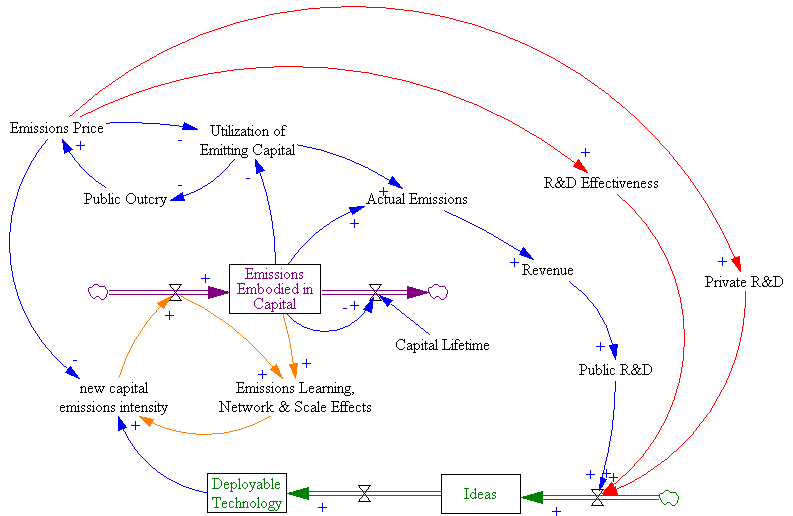 from a developing country perspective, at least three arguments run counter to that idea: 1) that the use of BCAs is a prima facie violation of the spirit and letter of multilateral trade principles and norms that require equal treatment among equal goods; 2) that BCAs are a disguised form of protectionism; and 3) that BCAs undermine in practice the principle of common but differentiated responsibilities. In other words: the advocates are a strong domestic constituency with material arguments in places where BCAs might arise. The opponents are somewhere else and don’t get to vote, and armed with legalistic principles more than fear and greed. Like the AOSIS draft, the LTCA draft is a bit coy about developing country actions, and there are a number of unsettled language variations, indicated by brackets. It sets a global goal of 1.5C to 2C, and emissions cuts of 50 to 95 percent from 1990 levels by 2050. Developed countries commit to between 75 and more than 95 percent by 2050, with interim targets of 25 to 45 percent below 1990 by 2020. 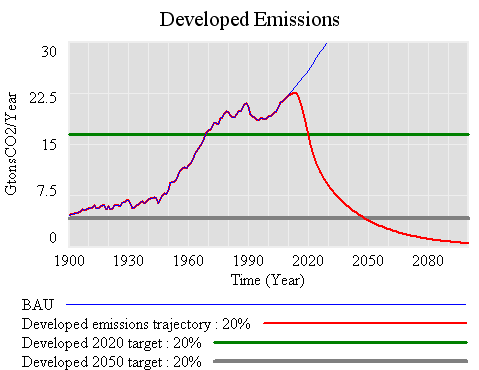 The developing countries are not explicitly subject to targets, but the combination of supported and autonomous NAMAs is “aimed at achieving a substantial deviation in emissions [in the order of 15-30 percent by 2020] relative to those emissions that would occur in the absence of enhanced mitigation.” The BAU trajectory against which that might be judged is unspecified. The bracketed options in the text create many possible permutations of the agreement. One is particularly illuminating: the least stringent global target (peak in 2020, 50% below 1990 in 2050) combined with the most stringent developed target (peak in 2011, 45% below 1990 in 2020, 95% below 1990 in 2050). That yields maximum possible emissions in the developing world, given the global and developed budgets. 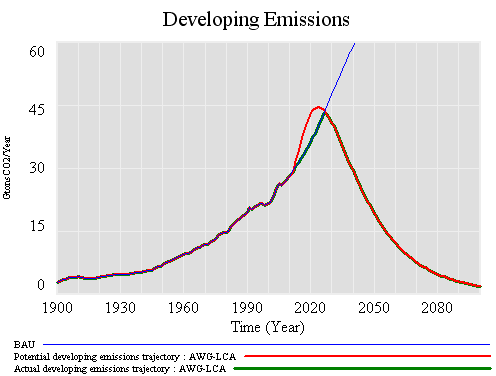 Emissions in the developing countries still must peak before 2030. 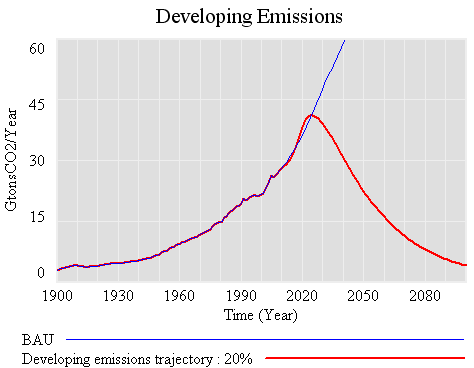 Note that, as in my AOSIS experiment, the potential emissions budget for developing countries exceeds business-as-usual; if BAU emissions don’t actually rise faster than anticipated, those emissions might be reallocated to delay the peak in emissions a bit, but not more than a few years. 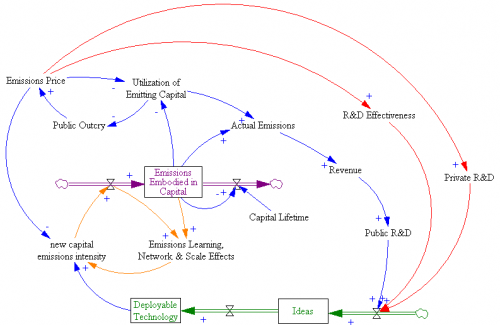 Interestingly, this scenario results in hyper-convergence, with developed emissions per capita falling well below developing emissions per capita. It’s unlikely that this is a physically or politically realizable situation, given that developed countries would have to reduce emissions far faster than the natural rate of capital turnover. The rapid decline would not benefit developing countries either, because buildings and infrastructure cannot be moved elsewhere. If developed countries make less aggressive cuts, to about -30% in 2020 and -85% in 2050, per capita emissions converge between 2030 and 2040. 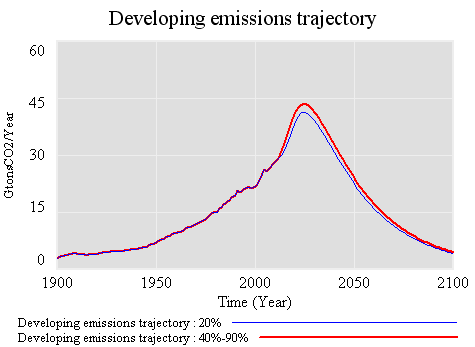 However, in that case, developing country emissions have to peak earlier and fall faster. The only way to delay the peak in developing country emissions significantly is to delay the global peak. 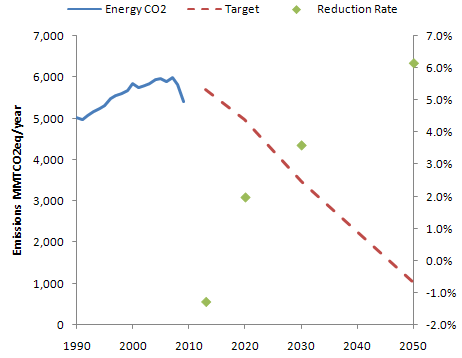 However, meeting the same global 2050 target with a later start requires faster declines in emissions, which quickly become impractical unless you assume some kind of technical miracle (not a robust strategy). Therefore, the only way for developing countries to avoid a peak in emissions in the next decade or two is to abandon any pretense of preserving a reasonable probability of meeting 2C or similar targets. That seems to be what some of the big emerging emitters are implicitly arguing for, but is it what they really want, or in their best interest? Afterthought: The big challenge is that the global and developed country targets are explicit, while the developing country trajectory those necessitate is not. The draft recognizes means for reducing developing country emissions (supported and autonomous NAMAs), but there’s no coordinating mechanism that ensures the outcome adds up to the global goal. Lack of per capita convergence in 2050. Requirement that the upper tier of developing countries set targets. 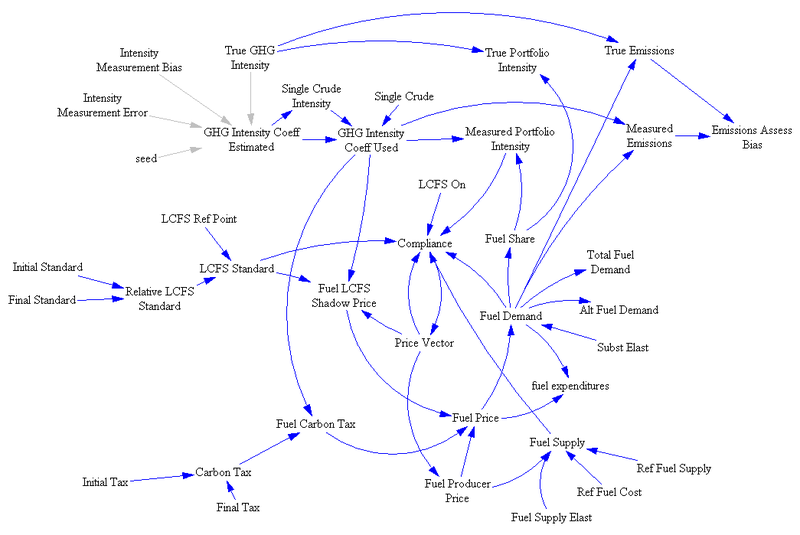 Institutional arrangements that determine control of funds and activity. 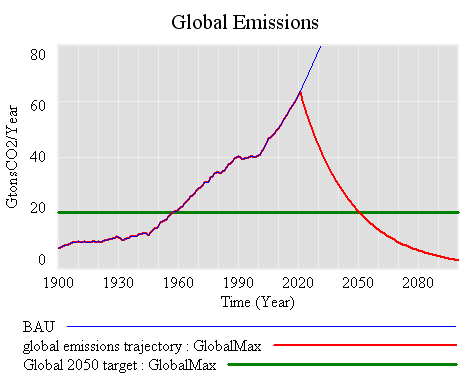 The global peak in 2020 and decline to 2050. These are evident in coverage in Politico and COP15.dk, for example. I’ve already tackled #1, which is an illusion based on flawed analysis. 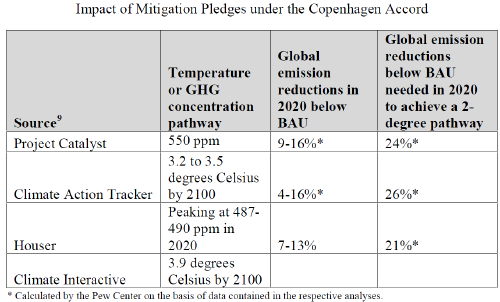 I also commented on #2 – whether you set formal targets or not, absolute emissions need to fall in every major region if atmospheric GHG concentrations and radiative imbalance are to stabilize or decline. I don’t have an opinion on #3. #4 is what I’d like to talk about here. There seem to be two responses to #4: dissatisfaction with the very idea of peaking and declining on anything like that schedule, and dissatisfaction with the burden sharing at the peak. One consequence of the smoothness constraint is that emissions reductions have to be faster later, to make up for the growth that occurs during a gradual transition from growing to declining emissions. Here, they approach -5%/year, vs. -3.5% in the “pointy” trajectory. A similar constraint arises from the need to maintain the area under the emissions curve if you want to achieve similar climate outcomes. So, anyone who argues for a later peak is in effect arguing for (a) faster reductions later, or (b) weaker ambitions for the climate outcome. I don’t see how either of these is in the best interest of developing countries (or developed, for that matter). (A) means spending at most an extra decade building carbon-intensive capital, only to abandon it at a rapid rate a decade or two later. That’s not development. (B) means more climate damages and other negative externalities, for which growth is unlikely to compensate, and to which the developing countries are probably most vulnerable. That’s a target that most would consider to be modest, yet to hit it, emissions have to peak by 2012, and decline at up to 8% per year through 2020. It would be easier to achieve in some regions, like the EU, that are already not far from Kyoto levels, but tough for the developed world as a whole. The natural turnover of buildings, infrastructure and power plants is 2 to 4%/year, so emissions declining at 8% per year means some combination of massive retrofits, where possible, and abandonment of carbon-emitting assets. If that were happening in the developed world, in tandem with free trade, rapid growth and no targets in the developing world, it would surely mean massive job dislocations. I expect that would cause the emission control regime in the developed world to crumble. The -20% in 2020 trajectory creates surprisingly little headroom for growth in the developing world. 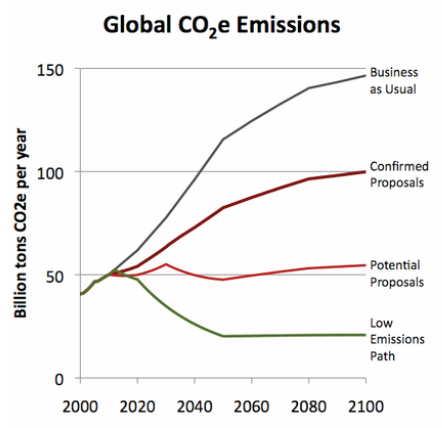 Emissions can grow only until 2025 (vs. 2020 globally, and 2012 in the developing countries). Thereafter they have to fall at roughly the global rate. 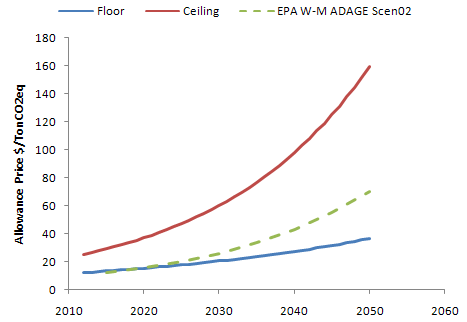 What if the developed world manages to go even faster, achieving -40% from 1990 by 2020, and -90% by 2050? Surprisingly, that buys the developing countries almost nothing. 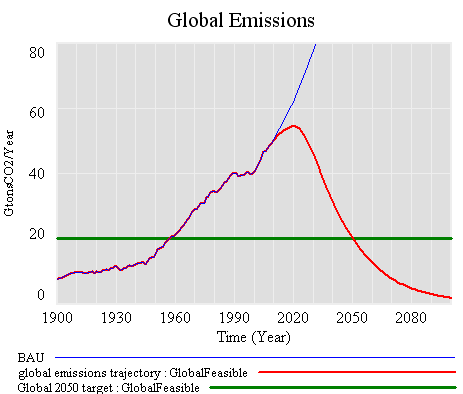 Emissions can rise a little higher, but must peak around the same time, and decline at the same rate. Some of the rise is potentially inaccessible, because it exceeds BAU, and no one really knows how to control economic growth. The reason for this behavior is fairly simple: as soon as developed countries make substantial cuts of any size, they become bit players in the global emissions game. Further reductions, acting on a small basis, are very tiny compared to the large basis of developing country emissions. Thus the past is a story of high developed country cumulative emissions, but the future is really about the developing countries’ path. If developing countries want to push the emissions envelope, they have to accept that they are taking a riskier climate future, no matter what the developed world does. In addition, deeper cuts on the part of the developed world become very expensive, because marginal costs grow with the depth of the cut. On the whole everyone would be better off if the developing countries asked for more money rather than deeper emissions cuts in the developed world. Certainly each of these ideas contains some truth, and each has played a role in the phenomenal growth of the developed world. However, each is also fallacious in important ways. The elements in (1) are certainly correlated, but the relationship between carbon and happiness is mediated by all kinds of institutional and social factors. The key question for (2) is, what kind of infrastructure? Cheap carbon invites building exactly the kind of infrastructure that the developed world is now locked into, and struggling to dismantle. (3) might be true, but I suspect that it has as more to do with inequitable distribution of wealth and power than it does with absolute wealth. Rapid growth can easily increase inequity. The empirical basis of the Kuznets curve in (4) is rather shaky. Attempts to grow out of the negative side effects of growth are essentially a pyramid scheme. Moreover, to the extent that growth is successful, preferences shift to nonmarket amenities like health and clean air, so the cost of the negatives of growth grows.